The average Canadian spends seven hours a day in front of computer screens, smartphones, tablets and e-books, and the blue light these devices emit can cause vision damage, sleep disruption and other problems. Why is blue light a problem? While sunlight also contains blue light it’s what helps us stay awake and alert during the day exposure from illuminated displays in the evening confuses our brains into thinking it’s still daytime, suppressing the natural secretion on melatonin, a hormone that signals to our bodies that it’s time to sleep. If you use an iPhone, the smartphone’s new “Night Shift” mode can be set to adjust the screen’s color automatically in the evening or late at night. If you use an Android device, there are several filtering apps you can use, like Twilight or CF.lumen. On your laptop, you can use an app called f.lux. Smaller screens emit less blue light so using a phone instead of a tablet helps so does reducing the screen’s brightness. Use an original black and white e-book, like a Kindle, or we know, this might sound crazy consider reading paper books in the evening (they don’t emit any blue light at all). Pick up a pair of amber-tinted goggles you’ll want ones that block blue light below 530 nm. The downside is you may not be very keen on the orange tint. The upside (or not) is that may look like Vin Diesel in The Chronicles of Riddick. Experts believe you don’t have to stop using your blue-light-emitting devices entirely. Just put them away two hours before bedtime. Have you noticed your sleep patterns affected by your smartphone or tablet use? Have you tried out any of our tips to lessen blue light exposure? Share your thoughts and experiences with the Shop Talk Blog community forum! Good article………but why didn’t you put Vidalux on sale at the same time…..
Hi. I personally don’t notice a change in my sleep habits but I use my devices usually only between 8am & 6pm. After 6pm I will watch TV for awhile before I sleep. That game for hours afterwards so I gave to quit a few hours before bedtime! Hi. During February I lost wireless as my satellite dish needed re pointing and I had to wait a month. I only had limited cell data. So I shut my android smartphone off early in the evening. Now I have had wireless back for three weeks and shut my phone off a half hour before dropping off. When I was shutting my phone off early in the evening I had too many nights I couldn’t get to sleep. Now I have had no sleepless nights since I got wireless back. So true and damaging. Must be confronted. I have Glaucoma,and I am under the good care of an ophtamologist. I do not use my cell phone,only for car emergencies. I have never really noticed. I might try this tonight and see if my sleep changes. I have not noticed any problems at this time but will keep this in mind. Thank you for your advice regarding blue light. I didn’t know there was an app to adjust a laptop’s light at night. Will be downloading it as soon as I finish this comment. I prefer to have a light on when reading from computer. Can I adjust the computer and TV screen to achieve the effect of the tinted glasses? I thought you offer surveys, not such dumb articles. That was why I unsubscribed. Such irrelevance. Very disappointing indeed! I knew this great for S. A D. patience . stay in awake is difficult for them. I have been using f.lux. It uses your location and time to reduce the blue colour from the screen at sunset and restore it at sunrise. It runs on Windows, Mac, Linux, Android and Ios. When I go to bed, I go to bed to sleep, not to read, not to blog, not to phone. Bed is for sleeping among other more luxury things. Get rid of the books, iPhones, smartphones, tablets and any other technology. We are addicted to our devices. We always have one in hand or nearby. We need to take breaks from them, for many reasons. I bought a smart phone a couple of years ago & hated it . I then bought a little flip phone and THAT is what I use . I think people are losing the art of speaking . They sometimes can be seen in clusters , each with his / her head pointed downward into their phones . I’ve seen couples in a restaurant texting – great DATE ! Possibly they’re texting one another ; do you think ? People are too enamoured with their bloody phones .People don’t write any more either – and , spelling – forget it !!! Really , they’re the ruination of this century ,to be sure !!! I can’t usey computer because we can’t get high speed here. I use a phone but it doesn’scales us work. When I get a sigal I do as much as I can before it disappears again. Not.much blue light here! Your computerized toys aren’t the only problem sources of blue light. The newer cars in Canada now come equipped with them. They are so bright, I have to wear sunglasses to stay on the road. It’s like the cars drive with permanent high beams on. Also, in the city of St.Catharines,Ontario,Canada, they are now installing blue lights in the street lights. So now I have them shining in my bedroom windows. I have a solid, dark brown, thick material curtain that usually blocks most of the light but it isn’t sealed to the wall; and it shouldn’t have to be to block the blue light. These lights also flicker like a strobe light when they are turned on. I suffer from Ocular Migraine. Just the change in light will do it. The answer/solution is really quite simple .. TURN THE DAMNED THINGS OFF AT BEDTIME. If you are that committed to your devices the problem is NOT the devices. I usually read at night just prior to going to bed but always read from a “real book”. Find a great way to relax and give my eyes a rest from electronic light. being married to an eye doctor, i do understand the damage that these devices can do, people are willing to spend thousands of dollars per years to get a shiny smile but seems to take their eyes for granted. we only have two eyes and they cannot be replace, yet some surgery which are done in time can save them in part because some people will go see their optometrist when they have a problem and sometimes it’s to late, the damage is done, teeth can be fixed or replaced without major problems NOT YOUR EYES, take care of them. let go your hand held devices for a day and see what’s surrounding you, talk with real people, touch them and feel the emotions of life, not the ones that are virtual. I don’t read from devices at night. I wear glasses or contacts. I read books only. Very good advice but limiting them for 2 hours before bedtime is easier said than done. I like to go to sleep watching shows or reading on my phone, tablet or laptop every night. I know it’s a bad habit but it’s a how I relax or catch up on shows that might contain inappropriate content I can’t watch around my children. I have found that needing to take a break from our devices works well. Lots of other stuff we can be doing. I have a kindle. I like to read in bed. Is it possible that it is bad for my eyes. I am conscious of my eyes as I have glocoma. Please let me know. I used to read just from books but since I got the kindle I read from that. 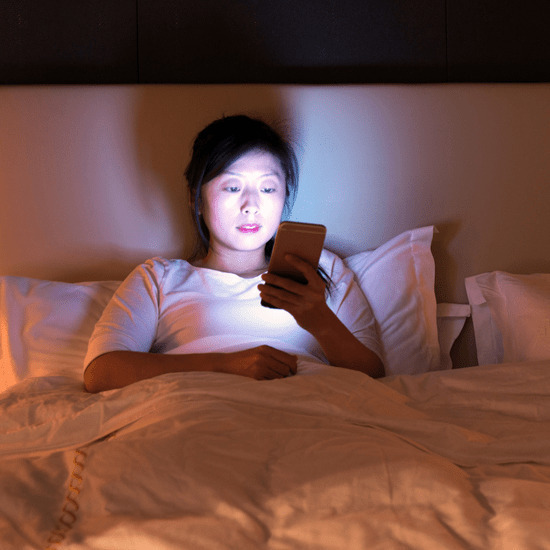 Is reading kindle in bed at night bad for my eyes? Based on what we’ve read, the Kindle paperwhite should not be bad as it has a dimmable light feature. This is not a problem for me! I don’t have or use any of those devices. Thanks! Wow, thank you for that information! Everyone that I know needs to be aware of the #bluelight problems. I’ll pass it along. Thanks for the info! Would love to get those goggles, thanks for sharing! The article is very interesting as are the comments. It is something we all should be aware of in this age of technologies. Very insightful. I got alot out of this very useful information. I try to take breaks as often as I can which means using my device bo more than 30 minutes at a time with a duration of 1 hour away from my device. My sleep is normal with the exception of my alarm set and ready to go off. I do believe enough time spent on any device can impair ones ability to focus and lose sleep. Thankyou for the interesting article I can’t wait to read more in the further months to come.